The Gifted Music School Conservatory is an international level, full scholarship program for serious and hard working music students (ages 6-19). Admittance is by audition only. The program nurtures and provides a learning environment where students are inspired by their teachers as well as their peers. Many will pursue music careers, while others will succeed in academic field. The program's goal is to inspire tomorrow's leaders and artists. Students are taught and mentored by world-level artists and pedagogues. GMS faculty are the some of the most respected teachers in their field. Classes include music theory, ear training, performance classes, music literature, piano literature, woodwind literature, piano ensemble, chamber music, solfege, and orchestral repertoire. 7 students at BYU, University of Utah, Westminster, and other fine Utah colleges and universities. GMS students are heard at national competitions (including Fischoff and MTNA) and dominant at all state level competitions. World class guest artists and teachers regularly come to work exclusively with the conservatory students. Past guests have included Veda Kaplinsky (piano, Juilliard School), Leon Fleisher (piano, Peabody), Roberto Diaz (Viola, Curtis), Joseph Silverstein, Robert Lippsett (Violin, Colburn), Dr. Yong-Hi Moon (piano, Peabody), Craig Jessop (choral, USU), Vladimir Kulenovic (conductor). This year's featured guests included Midori Goto (violin, USC), Sel Kardan (Colburn), Micah Yui (piano, Colburn), Andres Cardenes (violin, Carnegie Melon), Meastro Rei Hotoda, and Wei He (violin, San Francisco). Conservatory students receive a extensive full curriculum of instruction: theory, solfege, advanced performance class, chamber music, woodwind classes, and for keyboard students, piano literature and history. In addition, GMS conservatory students perform in the Fall Concert, Spring Gala Fundraising Event, Ballet West Academy collaborations, and Spring Concert. Students also perform community outreach events at public schools twice a year. Additional performance opportunities include home concert events and other community events as determined by executive staff. Past events have included featured concerts for non-profit events, spotlighted at local community library and film events, spotlighted for grand opening art houses. Gifted Music School Conservatory students have continued their education at Curtis, Juilliard, Colburn, New England Conservatory, San Francisco, Champagne Urbana, Stanford, Peabody, Vanderbilt, and all major Utah colleges. Current students are featured regularly with the Utah Symphony and many are award winners at national level events. The Gifted Music School Conservatory auditions are held once a year in the Spring. 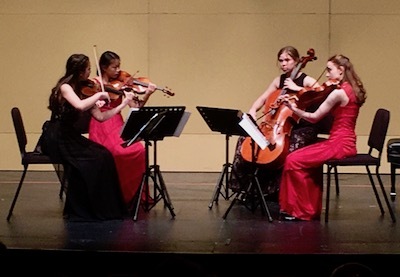 GMS "Olympus Quartet" at the 2017 Fischoff Competition. Inspiring fun at the conservatory.